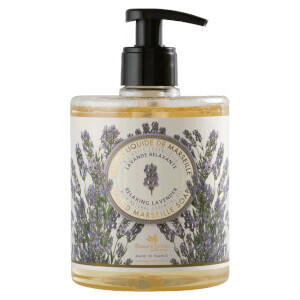 Pamper even the most sensitive skin with The Essentials Relaxing Lavender Liquid Marseille Soap from Panier des Sens. Formulated with natural Glycerin and vegetable oils using a traditional cauldron technique, the aromatic hand wash gently cleanses and refreshes even the most sensitive skin, without over-drying or uncomfortable tightness. Enriched with soothing Lavender Essential Oil (a little blue flower recognised for its flowery and fragrant scent), the formula releases a calming fragrance to help relieve feelings of stress and tension. Housed in a beautifully decorated pump bottle for convenient application. Aqua (Water), Potassium Cocoate, Glycerin, Polyglyceryl-3 Caprylate, Parfum (Fragrance), Hydroxyethylcellulose, Tetrasodium Glutamate Diacetate, Cocos Nucifera (Coconut) Oil, Potassium Benzoate, Potassium Sorbate, Lavandula Angustifolia (Lavender) Oil, Tocopherol, Linalool.